VIBE is a beginning strings program offered exclusively for elementary school students at Woodville Elementary School, and is presented in partnership with the YMCA. The mission of this program is to offer basic string instruction in a group lesson format, develop skills necessary for continued musical study and offer musical exposure to students who might not otherwise have the opportunity to receive individualized instruction. Students participating in the program are provided with instruments and method books. 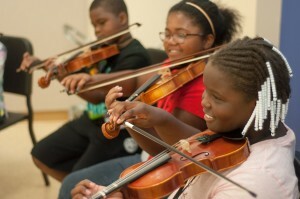 Instructional sessions are similar to those offered in school orchestra classes, with the added benefits of small group instruction. Sessions take place three times each week.